Listening to end-user feedback, RODE has developed a new lavalier microphone that fits right into our production style. Need to switch between a hardwired XLR and a Sennheiser wireless, no problem, simply unscrew the MiCon connector and switch. This feature alone is huge! Typically you would need to purchase wind protection such as Remote Audio's Microcat - now it's included in the box and ready to save your sound in those windy situations. Miniature capsule goes head to head with some of the biggest names in the business. $249 - priced right when compared to all other lavalier mics in this size and includes accessories. The only glaringly noticeable aspect is the lack of low end frequency response. 60Hz - 18kHz - the competition hits 20Hz - 20kHz. For dialogue, the low end is not needed and the boomy sound would mostly be handling noise, however, for those that like to use a lav as a plant mic, full frequency response is desired. I would have also liked to have seen a vampire clip such as the model included with the Audio Technica 899. However, the free water proof carrying case, ability to quickly swap connectors, 10 year warranty, low price and wind jammer are certainly reasons that some may want to take a closer look. As soon as I get my sample, I'll be putting up some tests. Has anyone done any live sound comparison between this and the Sanken COS 11D or the Sennheiser ME2 ? Given how pleased I am with my other Rode microphones, this has got to be a very exciting announcement. I'll be staying tuned for more. The Tram cable attach vampire clip, works with most 'normal sized' lav cables. I'd be interest in reading a field production test. Cable borne noise ect, ect. Thanks for posting this Guy. And a shootout between the ME2, COS11D, and the new Rode would be cool, and even throwing in the higher priced Sennheiser lav (I forget the name) would be cool. Would love to know how this compares against a Tram TR50 mic. Any thoughts Guy? Chad the singing review was entertaining. Thanks for sticking the COS-11D/Sennheiser ME2 tune in my head for the rest of the day. Thanks Michael! I write Jingles as part of my work, and sometimes people are annoyed that they can't get some of my tunes out of their heads. And even I can't say "COS11D" out loud without singing it now. Anyway, it's a pretty sweet little mic for sure. 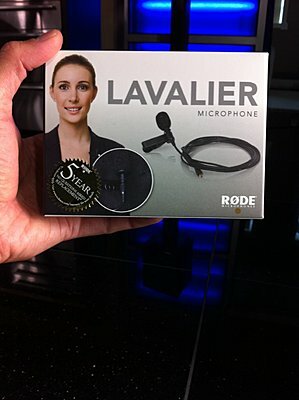 This new Rode lav mic is now shipping .. Guy, the warranty is 5yrs not 10.
and even throwing in the higher priced Sennheiser lav (I forget the name) would be cool. MKE 2 or the new (smaller) MKE 1 (the latter now in a paintable version for film, stage and TV work - MKE 1M). As you said, " it's not Lectro",.. or other $2k+ systems for that matter. But for the price! I have a few of each, G2s, 211s, and a 411. No G3 yet. In your opinion, does it handle high frequency (jangling keys) better than the G2? I've used G2's a couple of times when working so I am by no means an expert on them. I've not had the chance to try the key thing.... I was going to work on a new review over the next week or so, so I'll try to do it. one thing I did experience was a wierd set of drop outs about 2 weeks ago with the G3, only 5 ft from the subject. happened for 30secs and once I moved it never came back. its also VERY possibly what I picked up was actually the sound of a vacuum being used - I was shooting eye surgery. the G3's certainly have a lot more HF response then I am used to though, so the key test will be interesting. Thanks Allan. Yes, the sticker on the box says, "5 Year No Questions Asked Replacement"
The new RODE lav just landed here in the studio...I'm thinking about shooting a demo video. Anyone have any suggestions on what you'd like to see put in the vid? Something like Chad's please. The differences really stick in my head. No kidding!